February 5, 2019 marked the Lunar New Year and in chapel that day, Ashlee Rasmussen '20 and Julie Zhang '19 spoke about this important holiday celebrated by so many around the world. Hi I'm Ashlee and I'm Julie and we are here to talk about Lunar New Year! Today, more than 20 percent of the world is going to celebrate the most important holiday in China - Lunar New Year. 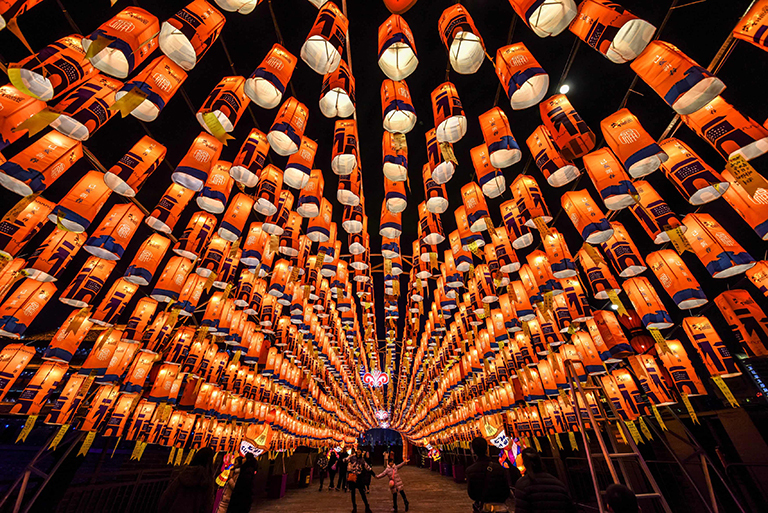 Chinese New Year typically begins with the new moon that occurs between the end of January and the end of February, and it lasts about 15 days until the full moon arrives with the Lanterns Festival. There are specific activities and traditions for each day. The year 2019 is the year of the pig. If you are born this year, then your zodiac is the pig. There are 12 zodiac animals, and the pig is the twelfth. According to the myth, the Emperor said the zodiac order would be decided by the order in which the animals arrived at his party. The pig was late because he overslept. In preparation for the holiday, houses were thoroughly cleaned to rid them of the inauspicious breaths, which might have collected during the old year. Cleaning was also meant to appease the gods who would be coming down from heaven to make inspections. Celebrations like dragon dancing, fireworks displays, and visiting a temple to pay respects to ancestors happens everywhere in China. In addition to these celebrations, food is one of the most important parts of the New Year. On New Year's Eve, the extended family gathers around the table for a meal that includes a last course of fish, symbolic of abundance and therefore not meant to be eaten. In the first five days of the New Year, people eat long noodles to symbolize long life. On the fifteenth and final day of the New Year, round dumplings shaped like a full moon are shared as a sign of the family unit and perfection. What does New Year mean to you? To the 10-year-old me, I would tell you I loved New Year. It is one of the longest breaks in the whole year. And what makes it better is that I would receive a red packet with money in it from my grandparents. Even though my mom would always ask me to hand it over to her, claiming that she would save it for my college tuition, I still enjoyed getting money and appreciated the wishes that my grandparents gave me as a child. But if you ask me now, the New Year means one of the times that I miss home the most. I got multiple texts yesterday wishing me happy New Year. Theoretically, with the help of technology, it should be easier for us to connect with people on the other side of the world today than many years ago. People say social media can make homesickness less overwhelming. However, while lanterns are hanging everywhere in my hometown and the fireworks are setting off during the midnight countdown, students like me who are studying in a foreign country are usually cramming for an upcoming test or working hard on a paper. The New Year scene is replaced by a day that couldn't be more ordinary. That is when I realized even technology cannot overcome the distance between here and my home. I spent the first Mew Year without my family four years ago. I remember celebrating it with my friends with a dinner in a Chinese restaurant in Cary. Although the dishes tasted nothing like what my mom cook on New Year's Eve, I felt thankful to spend this special time with my friends. Not being able to go home on New Year makes me not want to waste any time I can be with my family. As one of the most important festivals in many Asian countries, Lunar New Year is the time to stay with family. In China, it is when the biggest human migration in the world happens. Millions of city-dwellers get on trains, boats, and planes to go home. The experience is always a difficult one for people making the trip, with airports, roads, and trains overcrowded and uncomfortable. However, the unpleasant journey cannot stop them because they cherish the chance to visit their parents. As we grow up, it will be harder for us to spare time for our family. Even when we do, we might be on our phone and not communicating with them. Studies in many countries have shown that people are missing out on quality time with their loved ones. So, as the Lunar New Year arrives, I want to tell everyone that no matter how wonderful or depressing your life is, never forget to go home.